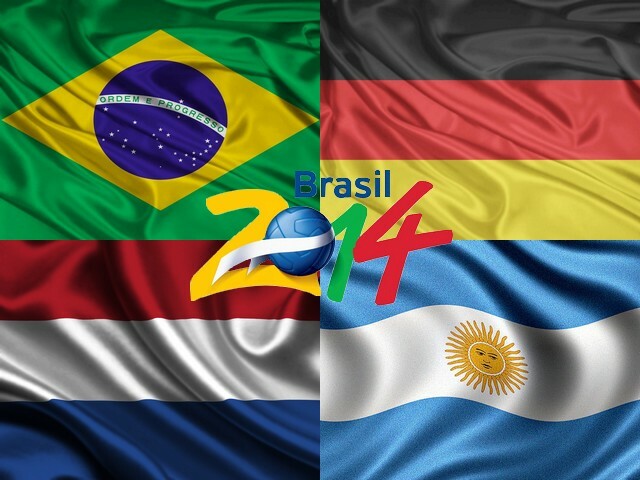 The teams have qualified in the semifinals of the 2014 FIFA World Cup are Brazil and Germany, The Netherlands and Argentina. Brazil came in the semi-finals of the World Cup for the first time in 12 years by beating Colombia 2-1, with the goals from the defenders Thiago Silva and David Luiz. Germany win over France 1-0 with, after the defender Mats Hummels scored in a free kick after 13 minutes. The Dutch team beat the team of Costa Rica 4-3 on penalties after the regular time and the overtime. The goalkeeper of Newcastle Tim Krul managed to save two penalties from Costa Rica's Bryan Ruiz, and ranked the team in the semifinals. Argentina beat Belgium 1-0, the only goal scored by the striker Gonzalo Higuain in the eighth minute of the match.